2016: Plow used for digging the furrow for transplants. 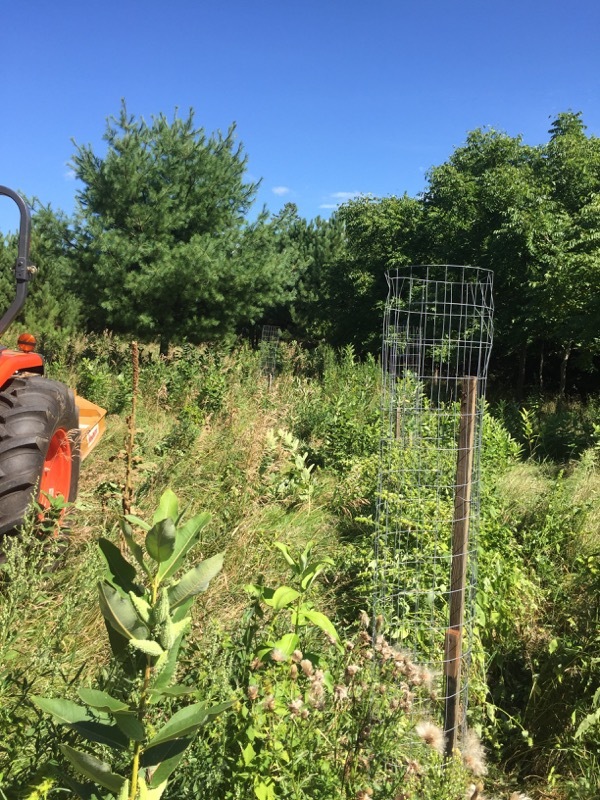 Transplant White Oak, Honey Locust, and Hybrid Poplar sticks from personal nursery in Madison into blank areas on farm in Centuria and TRY to keep the deer from eating everything. .
Monitor Walnut seeds left for the squirrels last fall. Half these are spread in soiuth half of old windbreak to try to re-establish evergreen. Half planted west of 'barn' in furrows. Mix Pine and Oak alternately in row. 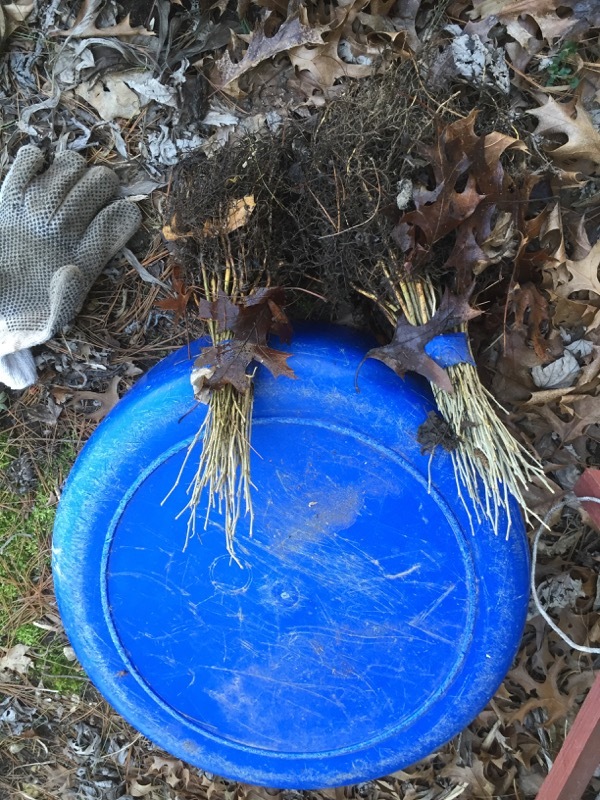 Monitor and release Oak seedlings from personal nursery in Madison. Mix of Red Oak and White Oak (Burr Oak), and Honey Locust. 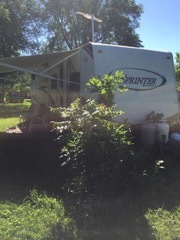 Second summer in our new trailer. Spend more time with Debi at farm. Take more arial photographs and videos fo the farm using new Drone. 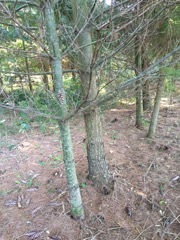 Prune pine and hardwoods for straight, tall growth. 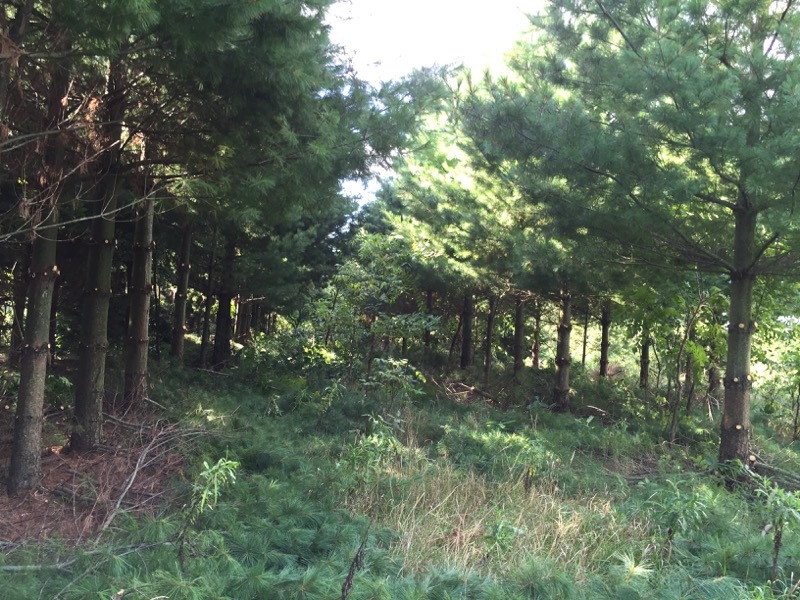 Clear brush and weed trees ONLY where they are directly competing with crop trees. 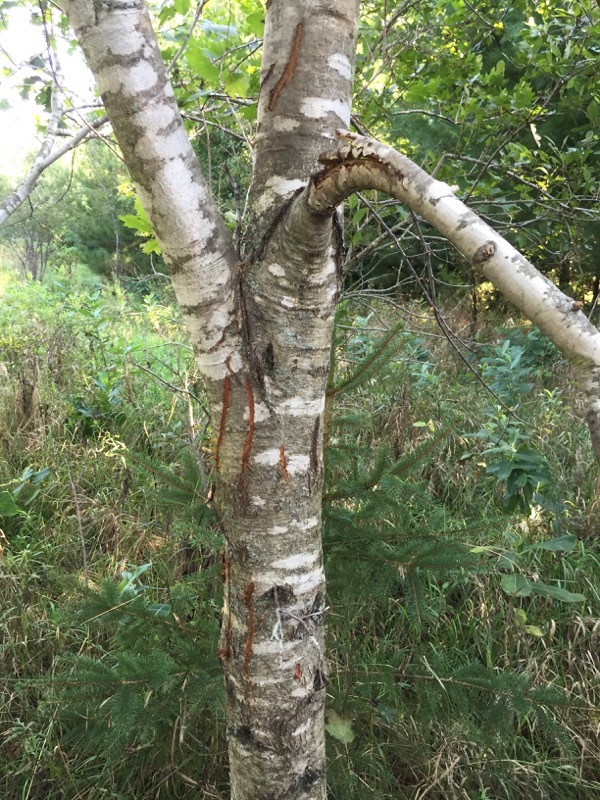 Things like Box Elder, Aspen, Birch, Poplar, etc will be crop trees where they fill voids. 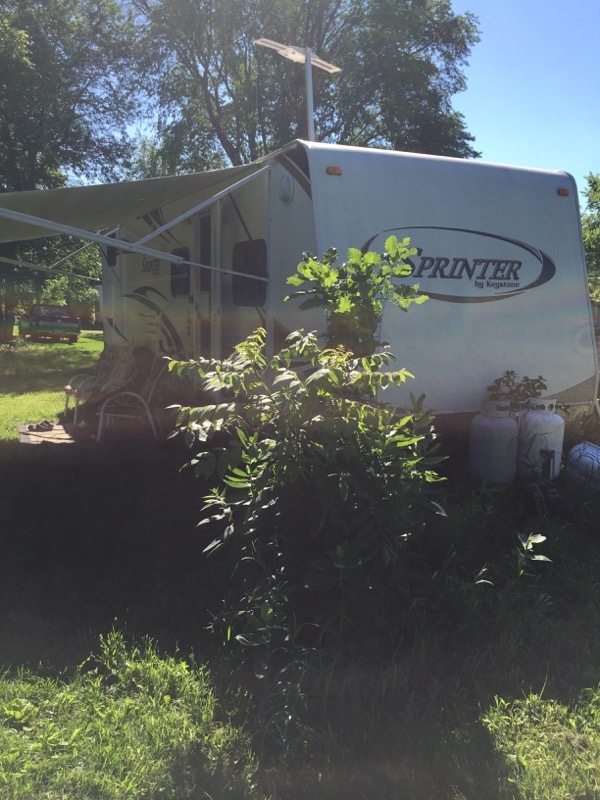 Second summer in travel trailer on farm. 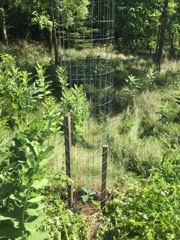 Here is one of the oak trees I planted in the farm yard and protected from deer with a wire fence. This is the only way to keep deer from oak (and many other species). May 2016: Walnut pile from last fall. 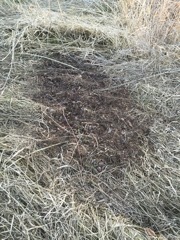 This is what is left of the pile of nuts I dumped here last fall. The squirrels have either eaten or planted all of them. Hopefully the squirrels buried most of them and forgot where they were. We have to wait a few years to see. 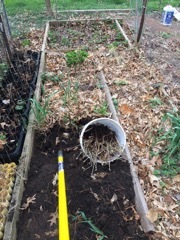 Digging up half my nursery bed of White Oak seedlings to transplant at the farm. I probably have about 200 seedlings that are going on their 3d season of growth. I also had a ton of Honey Locust seedlings in my garden last fall. These are volunteers from seed pods that I'd composted 2 years ago. These trees cannot be in my vegetable garden so I dug them for transplanting just in case they survive the ordeal. I am the eternal optimist. I have tried to get seedlings to start in the lower field many times and they get crowded out by the grass and weeds. One more time, I say, and dig the furrow for the transplants just below the fence to the old barn yard. 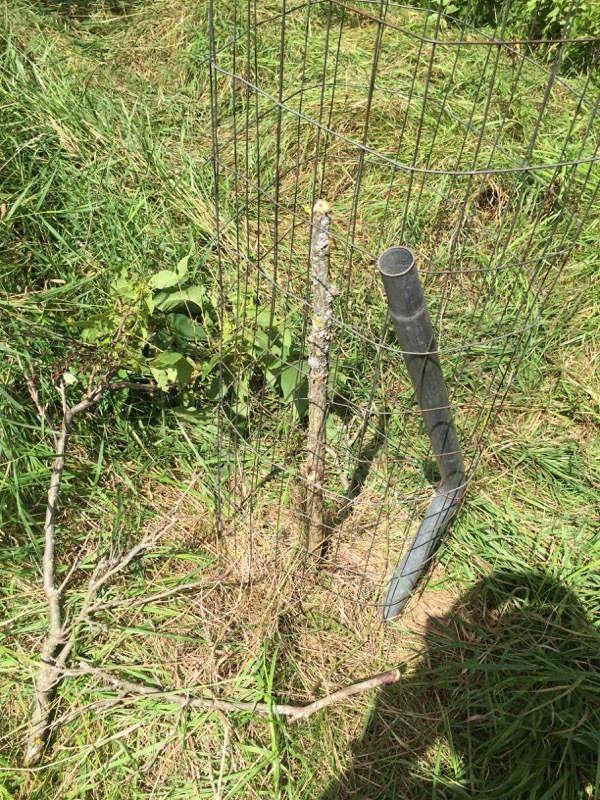 I plant White Oak and Black Locust in alternation, about one pace apart. I follow myself with a sprits of deer repellant for each transplant. In past years the deer have followed the furrow and nipped off the tops of each transplant within a day or two of planting - or completely pulled up, roots and all. I am trying the spray this year as an experiment and hope they will learn to stay away from fresh furrows. 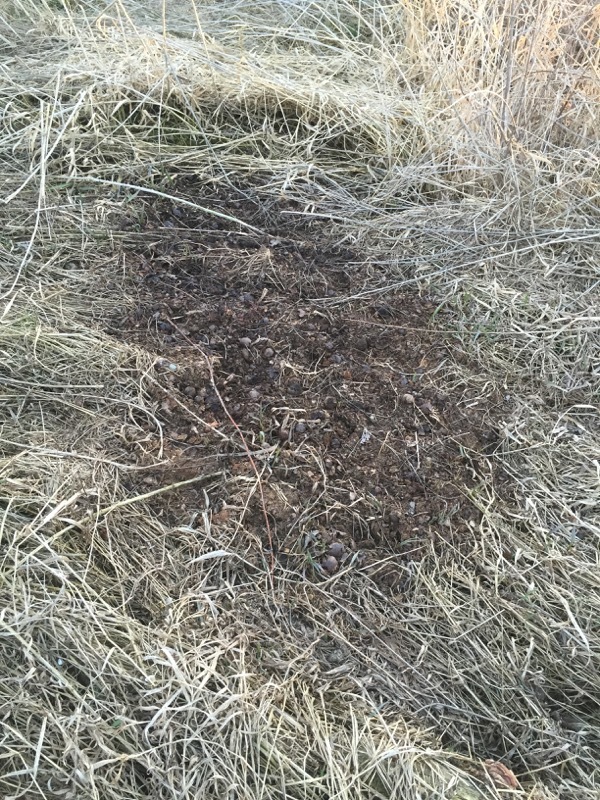 I know that this repellant only lasts for a little while (one or two rains) but that could be enough to allow the transplants to grow some roots and resist being pulled up. 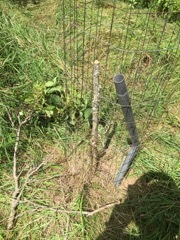 I have also applied a small amount of transplant juice to each new tree. This is simply a Miracle Grow solution to give the new tree a little leg up (help with some new roots). I can't spray repellant every two weeks so this is the solution I will try with a select few of these newly transplanted Oak. A few are all I can afford so I am spacing the cage placement on trees that are at mature distances from each other. Those in between will have to fend for themselves. 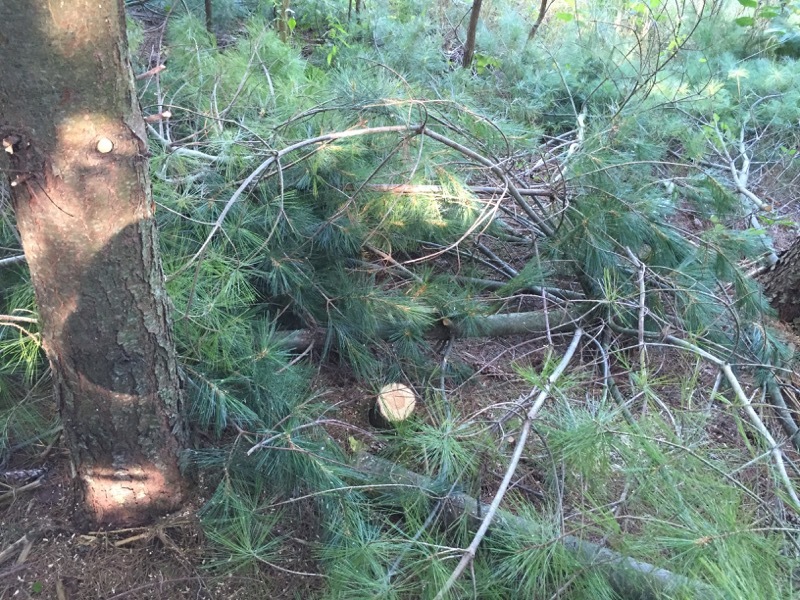 This planting was just north west of the spruce patch in a small clearing. I planted two furrows for about 100 feet. 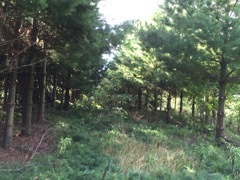 I also planted a furrow north of this location by the 3 birch (and the hunting stand). I couldn't find these furrows to put up cages. 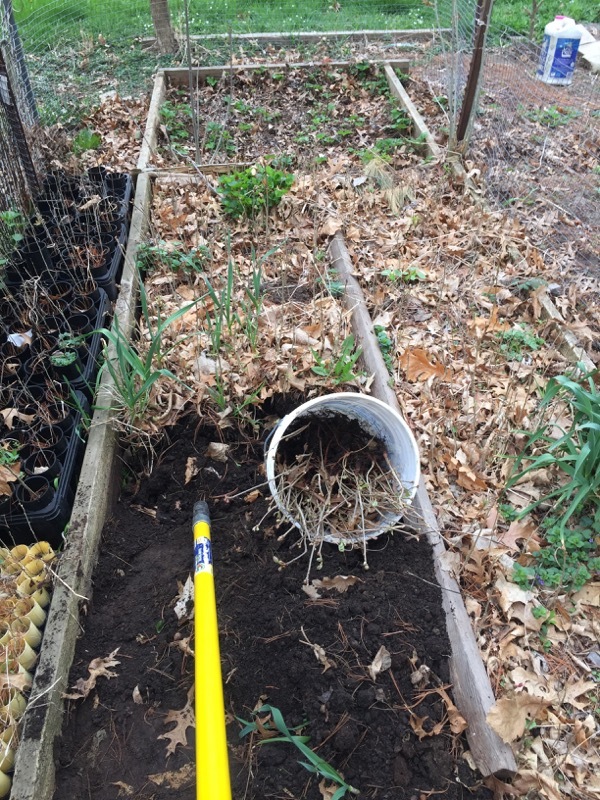 As shown above, I planted two furrows below the barnyard but these will need to wait for next spring since the weeds are too thick to see anything else. The Giant Ragweed is truly Giant in that bottomland. Here is a Walnut seedling which has been browsed by the deer for many years. 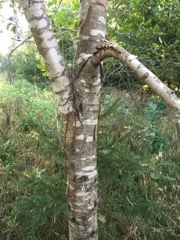 It is nothing but a bush and has no straight trunk/leader to prune back to. 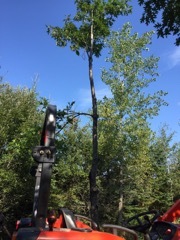 Therefore, I have cut the stem right off at the top of the straight part of the trunk. This will sprout a new leader bud next spring and this will become a straight trunk and after a few years you won't be able to tell that there was a cut. Click on the picture to get a closer look at the crooked top which is laying to the left of the new cage. One year we bought Red Oak seedlings from the to plant along with the pine and spruce. Many of these were successful in getting above the dear browse and have done quite well. As I worked down the rows I found the rows with these Oak. Some of the trees have grown to over 30 feet but their branches have been broken down by something. Snow? This didn't make any sense. Then I saw the long wounds in the bark. This was bear cubs playing in the trees. These must be perfect for climbing since they are the right size and have few branches (VS the pine/spruce or the Aspen). I believe that it's better to cut off these broken down branches rather than let them continue to crack and break. There isn't much left of the tree. There was a crotch at the very top and one branch had broken down and was hanging. I ripped that off because I couldn't reach that high to cut it off cleanly. I think it's better to rip it now than wait. 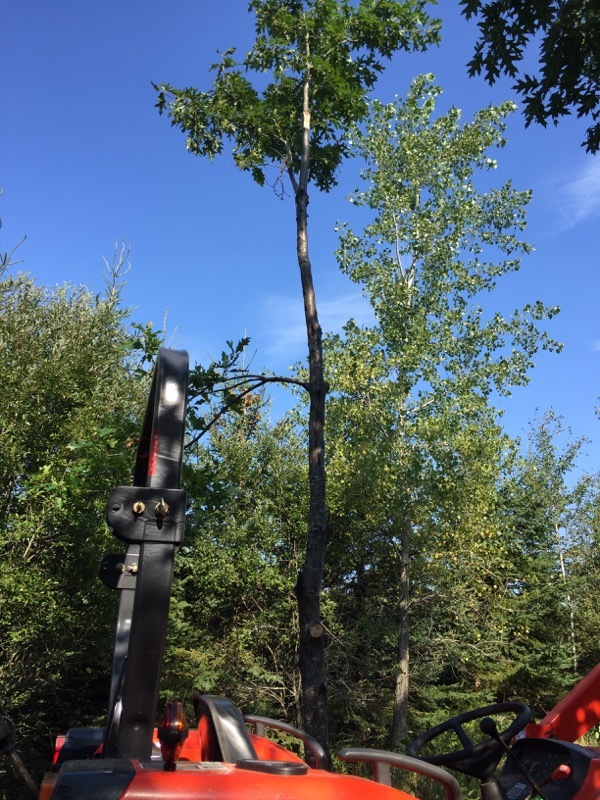 It may finish ripping during the time when the oak wilt beetle is around. Hopefully there is enough of the factory remaining to keep this tree healthy and growing. Remember how we planted these. In 1998 we walked between rows of standing corn with buckets of nuts and healed them in the soft ground (it was late fall). 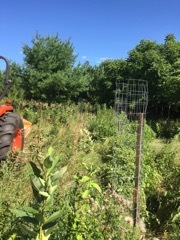 The pine (and oak) were transplanted between the walnut rows in 1999.It was the first year for the walnut (sprouting from seed) and it was hard to follow those rows with the planter. The corn stubble was still very visible so we could follow those those. We could see the new walnut just enough to know which rows they were in and we used that to determine the rows and then we used the corn as a guide. There were some places where the corn was very difficult to see and sometimes the rows wandered a bit. This is where I've been working this summer. I prune up the pine and dress up any Walnut that have made it above deer browse. Just get em in the ground. 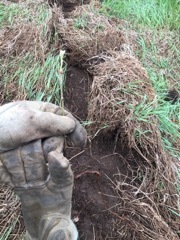 While we're thinking back to planting time, here is an example of the result of the frustration of some over-worked volunteers. 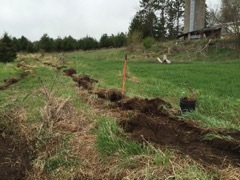 After a few thousand trees the temptation is to just get em in the ground as fast as you can. This is what happens. There is a bell on the planter that rings every 6 feet and the planters are supposed to wait for that before putting the tree in the trench. Someone didn't wait and now I have to cut down that little tree -- a wasted transplant. Not that big a deal here and there but if adopted as a policy we could have just thrown half the trees on the ground and saved ourselves a lot of work -- then and now. Click on picture to see result. I will take that little tree out now because it will not survive and it is competing with it's neighbor. Progress on 5-Mile Walnut stand. 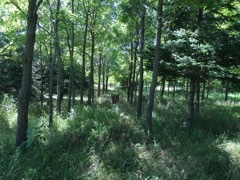 These were the first trees we planted (in 1997). 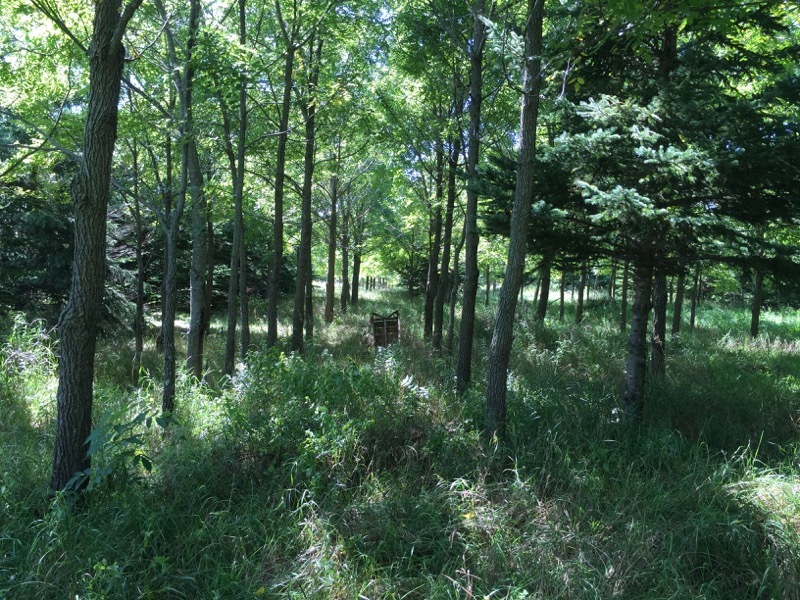 It was pasture land at the time and the only part of the farm that was not rented out to the neighbor for corn. This camopy is nearly closed. It is dark and the grass is having a dificult time growing. remove lower branches -- bottom 2/3 -- without opening the canopy too much. I will seriously need to think about getting an power pole saw to reach the top branches.